Friendly competition and music by the band Stealhead are part of this weekend's Dirksen Derby. Photos by Abe Blair and Pete Alport. When Tyler Eklund was paralyzed from the neck down in an accident at the 2007 Snowboard Nationals, the then-14-year-old didn't know how many friends he had. As it turns out, he has at least 500—probably many more—who have shown support for him year after year. For the past eight years, these friends have come together to raise money for Eklund and to express their admiration for this young man who had so much talent and potential in the world of snowboarding. 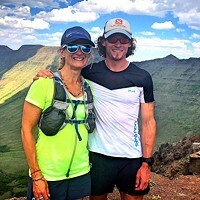 Those friends have organized the 9th annual Dirksen Derby presented by Patagonia and have a full weekend of activities planned on Tyler's behalf both in Bend and at Mt. Bachelor. Beginning Friday evening, Dec. 11, at the Midtown Ballroom at 51 NW Greenwood Ave., the "Dirksen Derby Kickoff Party" sets the tone for an entire weekend of festivities and competition. The centerpiece of the event is the "Broken Board" silent auction featuring regional and nationally-acclaimed artists using broken snowboards as their canvas. Local band Stealhead will perform, and there will be a raffle with donations from major name sponsors. A $5 donation can be made at the door. The festivities begin at 6 pm and continue until 10:30, with approximately 700 people expected to attend the event over the course of the evening. According to one organizer, Fabienne Dirksen, "We won't forget about Tyler. We won't just talk about him and forget him." His friends haven't forgotten about him, and eight years of support for Eklund has netted more than $100,000 for his care and needs. Last year the Derby raised $35,000, all of which was donated on Tyler's behalf. The focus on Saturday, Dec. 12, will switch to Mt. Bachelor's West Village, and the event has sold out in only four days with the maximum of 500 participants registered. 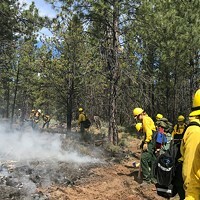 "It's amazing to see how quickly people signed up for the event," Dirksen says, adding that people are coming from points all over the United States and the world—Tahoe, countries in Europe, and even Japan. In addition to helping Eklund, the event brings snowboard, splitboard, and sit-ski communities together for a weekend of fun. Dirksen says she and her husband Josh, who organizes the event, are excited to make a difference in Eklund's life. As she puts it, "There is a lot of positive energy and good feeling at the event." There are two slalom courses set up for the competition. A green course is designed for all abilities of riders, and a red course is designed for more experienced competitors. After qualifiers, racers log a time down each course, and the racer with the fastest combined time wins the division. There are 11 divisions for men, women, teens and children, and they range from novices to professional competitors. Finals are held on Sunday, culminating with an awards ceremony at 3 pm. Then there's the after party at Velvet in downtown Bend that evening. In addition to the Mt. 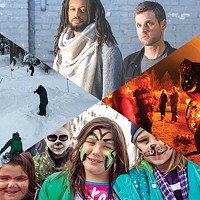 Bachelor activities, there's the Dirksen Derby Film Fest on Saturday, Dec.12, from 7 to 9 pm. Doors open at 6 at COCC's Wille Hall, 2600 College Way. The film fest not only features new films, but also a photo division competition open to all. Fabienne Dirksen says that she and other organizers are happy to make a difference in Eklund's life. He needs a great deal of help, and this annual event continues to grow each year on his behalf. Dirksen notes that Eklund is excited about the annual event in which he sees so many friends, and that he is amazed at how big the event has become. "He's an inspiration to all of us, and we look forward to many more years honoring Tyler and bringing the snowboarding community together on his behalf," she says. Her husband Josh adds that they do it for the right reasons, saying, "Everybody, including Tyler, gets something out of it." He says he is gratified at how the event has grown each year and looks forward to future events. As he put it, "There's no going back." 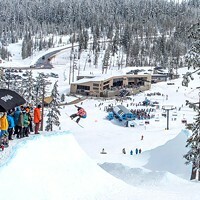 For a full schedule of Dirksen Derby events, visit mtbachelor.com/event/dirksen-derby.